The fun way to buy and sell. Do you ever wish your house and garage was less cluttered? You have a few options when it comes to getting rid of your clutter: You can either gift it to a charity shop, throw it away, or you can attempt to make a little extra cash. The last option is a good one if you want to try and line your bank account a little. For that reason, Craigslist is the ideal option. This audiobook will take you through every aspect of Craigslist and make a pro out of you before you begin your selling endeavors. After all, it’s worth knowing detail before you begin anything to make sure you don’t fall foul of pitfalls and errors. Ready to declutter and make some cash? Craigslist is a great way to get rid of items you might not need, and the plus point is that you do not have to go down the route of shipping items, as is the case with sites like eBay. You simply list your item, wait for a catch, negotiate if necessary, and then take the item to a drop-off point. You pass over the item, receive your cash, and boom! Job done. Of course, it’s never that simple, and those nuances are what this audiobook is all about. We cover areas such as how to register on Craigslist, how to find your way around the site, what can be listed, how to create a listing, how to maximize your potential sales, and how to negotiate the final selling price. From there, we cover safety, because let’s face it, you never know who you’re meeting until you get there! Inspiration to clear out your house and get selling! What if you want to buy something on Craigslist? We’ll cover that, too! You might see the ultimate purchase that you can't wait to own. What do you do? You contact the buyer and arrange price and pick-up. Before you know it, you own the item and it’s sitting in pride of place in your home. You can browse Craigslist from anywhere, either on a cellphone, tablet, or laptop. It’s online shopping made super easy, all for a much lower price than heading to the High Street. Unknown websites can be confusing, and at first, you might not trust it. We take away those worries and give you the very best advice on how to use Craigslist for the greater good. No fees, no stress. No need to learn as you go along, and no need to make mistakes - this audiobook will cut out the worries and simply lead you down a fast track road toward a decluttered living space and extra cash in your bank account. Learn the expert knowledge and secrets of the Craigslist world. From there, the sky is the limit. 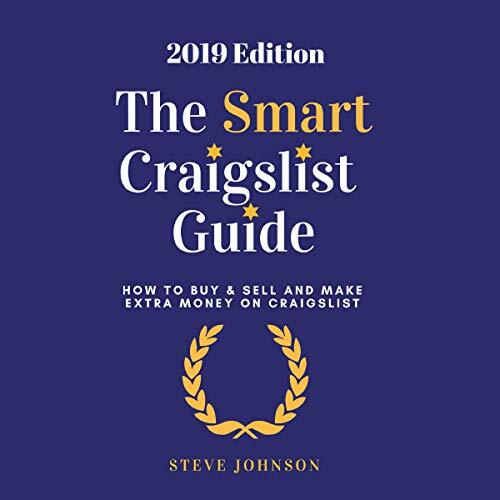 Download The Smart Craigslist Guide now! Grateful to this audio guide. Thanks a bunch! I have familiarized myself with the site already. Building sustainable wealth entails a lot of hard work and patience but the knowledge that I have the right book here with me gives me the motivation to harness my business acumen. I’m getting the most out of the Craigslist site with the help of this. It’s a definitive piece I can use time and time again especially now that I want to involve myself in it full time. It’s incredibly a good work and a friendly one. I just found out that Craigslist can be a powerful buying and selling tool if you know how to get the most out of it. I’ve already put some of these techniques to use. I’m really excited to see my results. I will update my review in the next few weeks. It has covered almost everything. For the price of the audio book, this is a sweet deal. I like what I heard. The marketing techniques surrounding craigslist are fully explained. It has tackled almost everything I need to make my selling in craigslist a success. I've been hearing craigslist years ago but I just ignored it. However, I'm now beginning to see its potential through the help of this audio book. I'm willing to put those ideas into action. This book deserves the merit. Avoiding scam attempts now by knowing what to look out for and that’s thanks to this brief but concise audio. I’ve started appreciating craigslist more. What a great place to buy and sell new and used items and this got me thinking. I have bought off Craigslist earlier and even though the maximum of my items are not roadside discoveries or garage sale treasures, I think there is a corner here for me too! Listening to this audio book feels like I'm actually talking with the author face to face. I have heard other books on Craigslist, but this audiobook stands out because of the good inside tips. The author’s writing style is quite impressive. There may have been some errors along the way, but it wasn’t noticeable because the content was good. One remarkable audiobook that I don’t regret downloading. I’ve been practicing the knowledge and so far, I can easily follow through because of the clear directives. I now have a good idea on what items to flip on craigslist! Sounds cool, huh? A well-founded audio guide with lots of tips to consider in craigslist ad site. It's simple and easy to follow. He gives many of his own experiences and lessons learned. Plus, the discussions are quite lengthy but simplified.